On Sunday 9th December 2018 Omagh Masonic Entertainments Committee hosted a luncheon for the widows and widowers of the four Omagh Lodges - Concore 332, St John's 334, Cappagh 350 and Victory 689. Brethren were encouraged to attend with their wives and children to give the occasion a family-friendly feel. 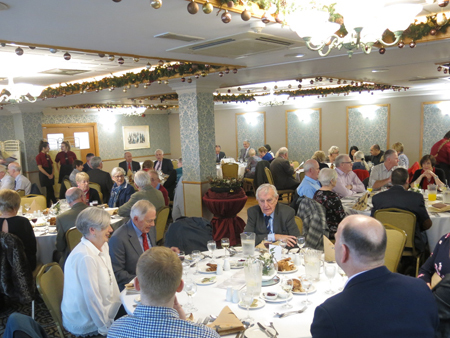 The proposal was well supported and thoroughly enjoyed by all, with some 70 persons sitting down for a festive lunch. For the widows it was an opportunity to meet up with friends whom, in some cases, they had not seen in long time. Some had travelled from places as far flung as Ballyclare and Portstewart and were delighted to greet those well known to them from the days when their husbands were members of local lodges. It was also an opportunity for Almoners to present the Lodge widows with their Christmas gifts and bring them seasonal greetings without having to make individual house calls. The enthusiasm of the widows for the event was such that it is likely to be repeated in 2019 and become a fixture in the Omagh Masonic Calendar.